A full house packed the Callan Theatre at Catholic University of America for the theatrical production of The Laramie Project on Friday, November 30. Written by Venezuelan-American playwright Moisés Kaufman and his New York City based Tectonic Theater Project company, this emotional drama depicts the true story of the murder of Matthew Wayne Shepard. Shepard was a gay 21-year old University of Wyoming undergraduate student who was brutally beaten, tortured, and left to die near the college town of Laramie 20 years ago in 1998. Laramie town locals Aaron McKinney and Russell Henderson were arrested shortly after the attack and charged with first-degree murder, and ultimately sentenced to life imprisonment, following Shepard’s death. His death was denounced as a hate crime against him as an LGBTQ+ person. Eleven years after his death, in 2009, President Barack Obama passed into law a federal hate crime bill known as the Matt Shepard Act to include crimes motivated by a victim’s actual or perceived sexual orientation, gender, and gender identity. In October of 2018, Shepard‘s ashes were interred at the crypt of Washington National Cathedral in D.C. 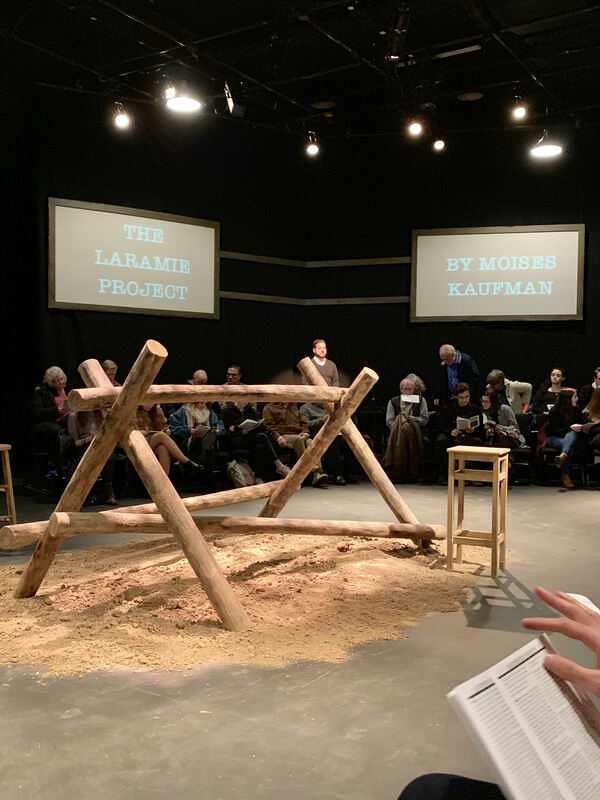 The play is based on hundreds of interviews conducted by the theater company with inhabitants of the small Wyoming town, the company members’ own personal journal entries, and various published news reports on the incident itself. Nine talented students, including four men and five women, portrayed a wide assortment of characters. These included Laramie’s colorful local residents, Matt’s closest friends as well as his university teacher from college, and the town’s own religious leaders. Senior drama major, Annaliese Neaman, who played eight characters in the ensemble, was inspired to audition for this production to have the opportunity to highlight subjects that often get little to no attention. Neaman and the rest of cast tirelessly prepared for this production months before its release in order to get it right and respect the legacy of Shepard. Students in the audience praised the entire production. The play was directed by Matt Ripa and this is the second time The Laramie Project has been produced at Catholic. The first was a student-run production put on by Center Stage.